NEW YORK -- Thanks to the National Recreation and Park Association and Disney, sixteen communities are getting grants to improve their local parks. The money is funding project that connect kids to nature, encourage healthier lifestyles, and increase kids' access to sports through the "Meet Me at the Park" initiative. Here's more from the National Recreation and Park Association (NRPA) about how it all works. Meet Me at the Park projects will include activities like planting community gardens, improving trails, and refurbishing playgrounds or soccer fields. This is the third year NRPA and The Walt Disney Company have collaborated on this initiative. * First, they may nominate a city anywhere across the United States to be entered for a chance to win a $20,000 grant to support a park in need within that community. * Second, they may vote on one of three park improvement projects in 15 designated markets to help determine which project will receive a $20,000 grant. People may come back and vote daily throughout the month of April. The project with the most votes in each designated market at the end of the month will receive a grant and will implement the winning park improvement project this summer. Similarly, the write-in city with the most nominations at the end of the month will receive a grant to support a park in need within that community. People also may text to vote for a park improvement project in each of the 15 designated markets every day in April. To encourage participation, NRPA is hosting an online sweepstakes giving away a tablet outfitted for the outdoors and exploring parks. Every time someone casts a vote, they will receive an entry into a random drawing for the tablet. So, if someone nominates a city and votes on the park projects in the 15 cities everyday (16 votes total per day) they would have a grand total of 480 entries for the month in the drawing to receive the tablet! Lastly, we are asking people to get out into their favorite parks and take a "parkie" - a selfie in the park that inspires others to vote for park improvements. The general public will have the opportunity to vote online for one of three potential projects for each of these communities via NRPA.org/BeInspired or through the text-to-vote option. 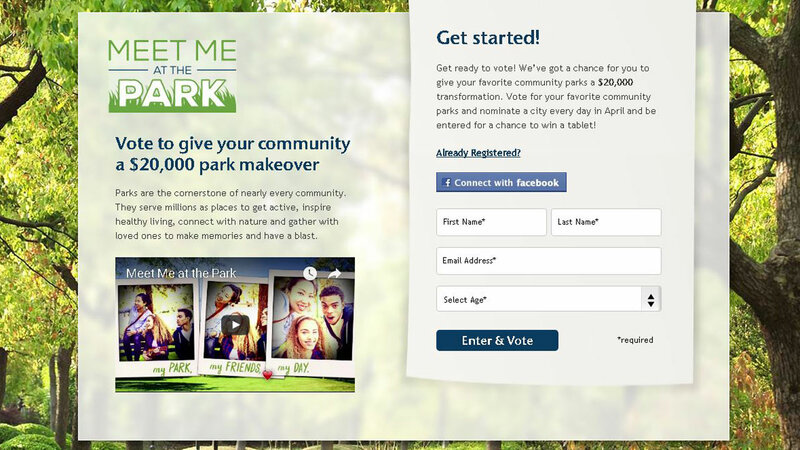 Additionally, anyone may nominate a city anywhere in the United States to win a Meet Me at the Park grant. The winning parks will be announced on May 18. In addition to implementing the winning projects, partnering park and recreation agencies in each market will host at least one community engagement event - such as a groundbreaking, volunteer day or ribbon cutting celebration - and will offer at least one opportunity for volunteerism for employees of The Walt Disney Company.